My husband would love to wake up to the smell of fresh baked Chocolate and Coffee éclairs on Fathers day! Ot make them for Dad and you will be the favorite child! This is a long one, so bear with me (it is worth the effort!). For choux pastry: preheat the oven to 350°F. Put the water, milk, butter, salt and sugar in a medium saucepan over medium heat. Stir constantly with a silicone or wooden spoon so that the sugar doesn’t burn and cause the mixture to stick to the bottom of the pan. When it comes to the boil, quickly stir in the flour and mix together. Beat the dough vigorously until it cleanly leaves the sides of the saucepan – this can take up to 5 minutes, depending on the heat. Transfer the dough to a stand mixer or mixing bowl (using an electric whisk) and beat in the eggs, one at a time. You might not need all 6 eggs – flour and eggs behave differently no matter how many times you make the same recipe, so the number of eggs needed can vary. As you add the eggs and beat them in, watch the dough and when it is soft and smooth and drops off a spoon leaving behind a ‘V’ shape, it is ready. Spoon the dough into a piping bag fitted with a plain nozzle/tip and pipe into oval éclairs about 10 cm long on a baking sheet lined with greaseproof paper. Bake in the preheated oven for 10–15 minutes or until puffed up and golden, then turn the oven off and leave the éclairs inside to cool completely and dry out. Melt the chocolate on low power in a microwave or in a heatproof bowl over a pan of simmering water (not letting the base of the bowl touch the water). For the Crème Pâtissière: split the vanilla bean lengthwise using a small, sharp knife and scrape the seeds out into a large saucepan. Drop the bean in too and pour in the milk. Bring to the boil over low heat. Meanwhile, in a mixing bowl, whisk the sugar, egg yolks, cornflour/cornstarch and custard powder together with a balloon whisk until smooth and creamy. Pour half the boiled milk into the mixing bowl containing the egg mixture and whisk together. Now pour the contents of the bowl into the saucepan where the remaining milk is. Fish out the vanilla bean with a slotted spoon. Over a low heat, whisk the mixture until it thickens and starts to bubble. After 5 minutes, the heat will have cooked the cornflour/cornstarch and custard powder and become thick and rich. Finally, add the butter and whisk it in until melted to further enrich the crème and make it extra glossy. Transfer the crème pâtissière to a bowl and immediately place a sheet of clingfilm/plastic wrap over the surface to prevent a skin from forming. Fold the melted chocolate into the crème pâtissière. Allow to cool completely before using. For the coffee ganache: put the cream, coffee granules and liqueur in a saucepan and bring to the boil over low heat. Pour the boiled cream into a wide, heatproof bowl and add the chocolate and butter. Using a spatula, start to mix the ingredients in a circular motion, just in the centre of the bowl. Keep mixing in a tight circle until the chocolate starts to melt and emulsify with the liquid. Gradually widen the circle until all the chocolate has melted and you have a shiny, smooth ganache. Take a cooled éclair and dip the top into the ganache. Shake off any excess, turn up the right way round and allow to cool and set slightly on a wire rack. Repeat with the remaining éclairs. Give each éclair a second dip in the ganache and allow to set again. 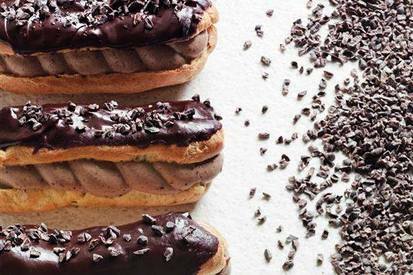 Give each éclair a third and final dip in the ganache to make a thick, dense topping. Allow to set completely. When the ganache has set, carefully cut each éclair in half horizontally. Fill the piping bag with chocolate crème pâtissière and pipe a generous coil along the cut side of the bottom half of each éclair. Sandwich with the other half of the éclair. Sprinkle cocoa nibs over the top of the éclairs for a crunchy finish.